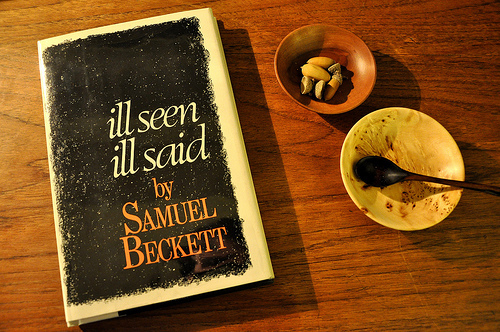 I've had many questions about my blog name recently so thought I'd explain: My blog is named after a short novel by Samuel Beckett, my favourite writer. The copy in this photo is a first edition that I treated myself to when this blog turned three! Ill Seen, Ill Said - the blog - was started in 2007. In 2008, it won CIRA's "One Million Dot-ca Domains". In 2011, it won First Prize in the 2011 Canadian Webblog Awards, Writing & Literature. It was also nominated Best Blog of the Diaspora in the Blog Awards Ireland 2013. PLEASE NOTE: At this time, I do not accept or post advertisements, advertorials, sponsor content, affiliate links or any kind of native advertising on my blog. Born and raised in Ireland, I attended university at Trinity College Dublin where I studied Philosophy. I completed my MA in Philosophy at University of Calgary, specializing in Philosophy of Mind and Aesthetics. Afterwards, I returned to Ireland. During this time, I joined the Gallery of Photography and the National Photographic Archives and studied in their darkrooms. In 2003, I emigrated to Canada, settling in Toronto. By day, I manage the editorial strategy of the Life, Travel, Homes, Autos and Health channels of Postmedia Network's online properties. In my free time, I scribble short stories and write freelance articles, blog posts and more. Visit my portfolio site here.